I am such a sucker for cauliflower, love it to bits. I grew up on this curry & hot rotis dripping with home made ghee. I had an appetite of a horse, lol! Thin as a stick and always outside playing or running….no wonder I could eat like a pig. Every time I make this it transports me back to my childhood. A lot to be thankful for, my mom has not only been my best friend, but a big influence in my life. From the first crush to gossip…there was nothing I would not tell her, intact even today I share a lot with my mother. She always reads ALL my posts and gives me numerous suggestions. When some of her suggestions are not in line with my thinking, she tells me she’s ahead of her times :). This one to her and the numerous meals she has fed us over the years with a smiling face. Cauliflower is the new fashion icon, so I hear…never been the kind to follow trends. For me it’s up on my food pyramid right from childhood. 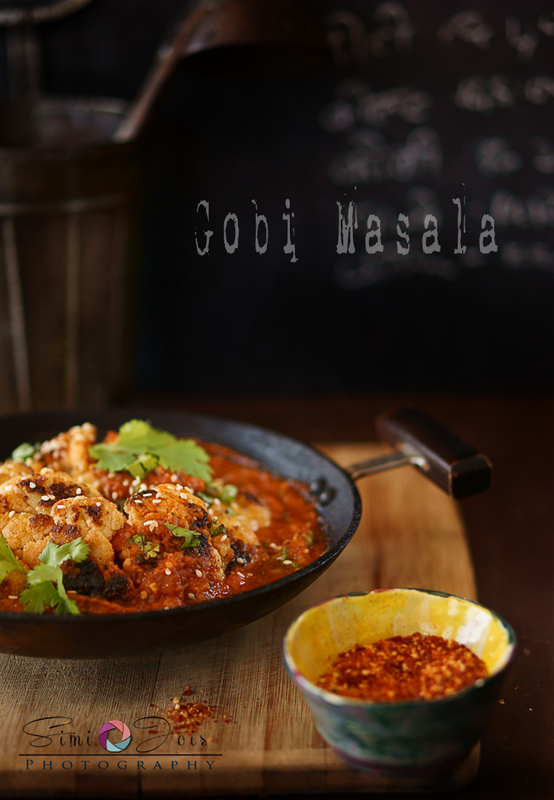 The crispy roasted cauliflower coated with the curry is irresistible. 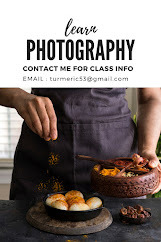 If you are new to Indian cooking, this might be a great place to start. If you have cut huge chunks of cauliflower then leave them in boiling water with salt in it for about 2-3 min. Remove and pat dry. If the chunks are small omit step one. Heat oil in a shallow pan and invert the cauliflower so the flower part is roasted in oil, sprinkle a little salt. Move it around so the whole cauliflower is roasted. It’s a bit time consuming, but mind you it’s really worth it. Once you have done this for all the flowerets, put it back in the pan and cover it, the latent heat helps it cook. Don’t overcook, there is nothing worse then an overcooked soggy cauliflower. In a blender blend onion and ginger. Take a saucepan and heat 1 tbsp oil, add cumin, let it splatter, add the onion paste and let it reduce till it is a pinkish-brown color. Blend the tomato to a smooth paste, now add the tomatoes to the onion and sauté, add water if it is too thick, add salt, turmeric, coriander and cumin powder. let it simmer, add the peas and bring to boil. 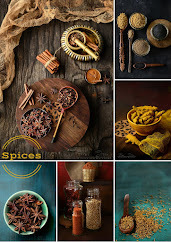 Add garam masala and almond meal, mix well. In your serving dish arrange the cauliflower, add pour the curry over it. Garnish with cilantro and toasted sesame. 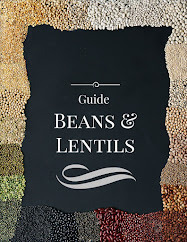 Serve with flat Indian bread. I'm just looking at this and I know for sure my brother would love it!!! Just like you, he loves cauliflower and that's the only vegetable he knows!!! :) The pics are just so good... as usual!!! Cauliflower is my favorite with Rotis and now its my kids favorite too :). The curry looks delicious!! Mouthwatering! 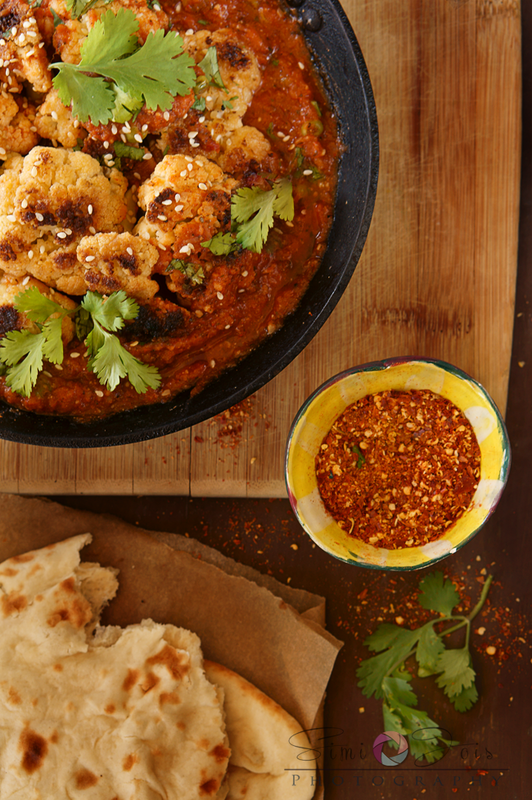 I love cauliflower and curries, so this dish is for me. 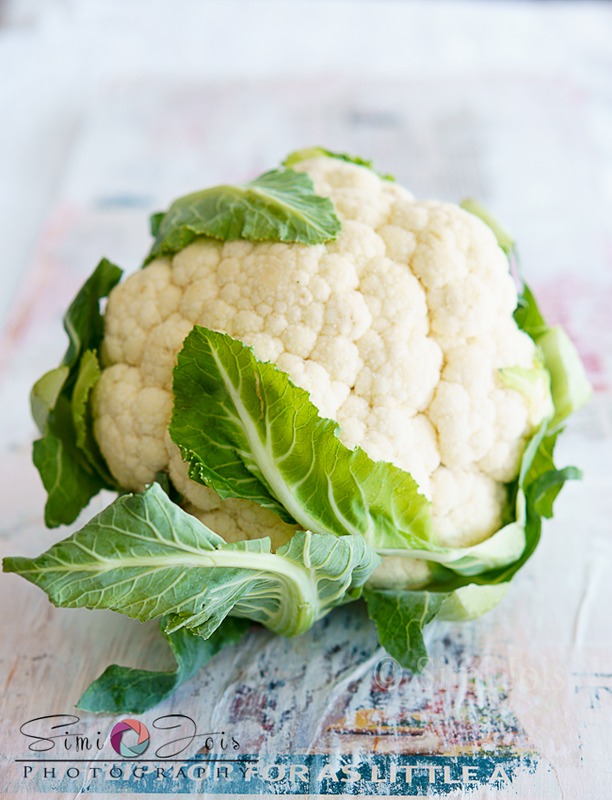 Cauliflower is one of my favorite vegetables (I have many) so I am always excited to see a recipe for it I have not tried before. Aloo Ghobi is my favorite Indian dish. I like the tomoto base in this ... now all I need is a hot roti! Super rich looking curry, just need some rotis to enjoy with this fingerlicking curry. 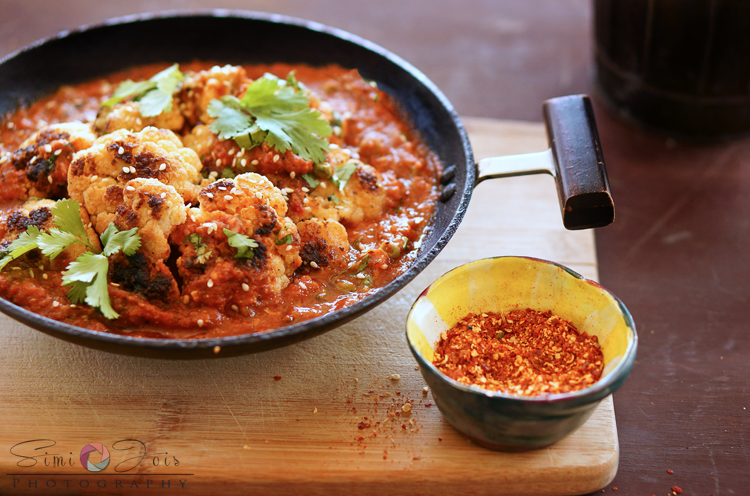 Delicious looking cauliflower curry... Would love this some hot roti.. Grew up eating this dish but your addition of toasted sesame inspired me to cook it tonight one more time :) Fantastic images! Thanks Robin, coming from a talented guy like you take it as a huge compliment. Now this is something I really need to give a try. Looks wonderful.